a couple of summers ago, after coming across an article on facebook which highlighted the ten best swimming holes in texas, we decided to sneak away for a long weekend with our boys to check out a couple of swimming holes out for ourselves. that year we didn't want to spend a lot of money so we opted to stay at a holiday inn in marble falls (only because we had some hotel points we could use) for just a couple of days. it was central so driving thirty minutes or so to a couple of holes was no big deal at all, especially since any drive in the hill country is scenic and beautiful. on that trip we visited hamilton pool and krause springs (i blogged about it here). as texans, we are born with a ton of state pride as it is, but we were all blown away by how unbelievably beautiful these little spots were and just a short road trip from our own backyards. we vowed to do a similar trip again once crosby was a little older. we've been daydreaming about it since. this summer we decided to check out a few different swimming holes on the list for a longer trip. and no hotel this time. we opted rent a cabin in wimberley a) because wimberley is gorgeous b) it's just a few hours from home and c) there are three swimming holes in town (no need to drive thirty minutes to the closest one this time). if you are a texan, this trip could not be simpler. 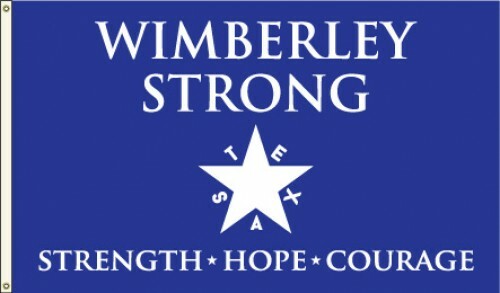 and even if you aren't, wimberley is a thirty minute drive from austin. easy peasy, lemon squeezy. day one: austin is three hours from dallas, so we left in enough time to grab lunch and spend a couple of hours there before we checked in to our cabin in wimberley. if you only have an hour or so in austin, you can never go wrong with south congress. our must-do's include jo's coffee for iced turbos and amy's ice cream for, you guessed it, ice cream. all enjoyed while window shopping at all of the quirky shops in the area (my favorite is tesoros trading company). our cabin was ideal. two bedroom, one bath named falls cabin situated on smith creek. the falls were directly in our backyard and emptied into a shallow swimming hole. the hill country got a lot of rain this year, so the falls were constant and the water in the hole was moving, so we had no problem letting the boys explore and swim their little hearts out (which they did). the property was located five minutes up the road from town and anywhere from 5-15 minutes from the multiple public swimming holes in the area. day two: our rule of thumb when visiting swimming holes is to get there when they open, which is usually 10 am. many places only allow a certain number of people/cars. this day we went to blue hole, which was highly recommended to us for good reason. there is a reasonable entrance fee per person and here you can stay as long as you like. not only was this place breathtaking, the grounds were also pristine. my favorite part of this hole was the large grassy area next to it which allows guests ample room to spread out blankets, set up chairs, picnics, you-name-it. that is not the case for other places we have visited. the water is clear and frigid. there are two rope swings and the river is wide enough to swim/move around with ease. when you ask our boys which is their favorite hole, blue hole is their answer. that evening we decided to drive to alamo springs (instead of austin, which is closer) to see the bats. about an hour away, we left early enough to make a luckenbach pitstop on the way. and you never really know what you will see once you're there. this time i drooled over this truck and trailer parked out front. it was owned by a cowboy (obviously a regular) who drove up from mexico for a visit. he designed the art and is partner back home hand-painted iconic mexican art on his truck and iconic texas images on the trailer....nasa, nolan ryan, blue bell ice cream, whataburger, dr. pepper. i bet tim riggins and coach taylor like luckenbach. next, we headed to old tunnel state park in alamo springs to buy our tickets for the bat viewing and then skipped next door to have one of the infamous burgers at alamo springs cafe. bats and burgers in the middle of nowhere, it's all so weird and wonderful. i love it. we didn't have to be back for the bat viewing until 8:30, so we had time to kill. we drove to fredericksburg, caught the tail end of a farmers market, bought and snacked on fredericksburg peaches until it was time to go back. i don't have any photos of the bats, but here is the tunnel that approximately three MILLION of them fly out of every summer night at around 9 pm for their gluttonous insect feast. there were so many of them that they collectively looked like a puff of smoke swirling around in the night sky. it was awesome and creepy, but mostly awesome. day three: jacob's well was on the itinerary. we arrived around 10:30 and were informed that reservations are recommended because they sell only a certain number of tickets in shifts. for example, the first shift is from 10 to noon. only a certain number of people are allowed in and once your shift is up, an employee tells you to leave the hole as the wave of people arrive for the next shift. there is a ten minute hike down to the hole. the swimming area itself is very narrow, not much room to set up chairs or blankets, and it's banks are rocky. the water at this hole was by far the coldest of any other hole we visited. again, the scenery was beautiful. there were large rocks where the brave could climb up and jump off into the "well". the majority of the water is waist deep except for the well, which is small and incredibly deep. we rewarded ourselves with a drive to driftwood for lunch at salt lick. my husband ran into some people he went to high school with sitting at the table next to us (typical). that man knows everyone. lunch was delicious. our kids were insane. we've been dragging their butts to restaurants since they came out....you'd think they'd know how not to act like complete knuckleheads at the table by now. friends recommended visiting a winery in driftwood as well as an amazing italian restaurant, but that was not in the cards for us this time. raising these boys reminds me a lot of raising labrador retreiver puppies. they're cute, they're rambunctious, they're clumsy and they do not (yet) belong in a winery. especially since i can't get them to keep from biting each other at the table. yes, biting. 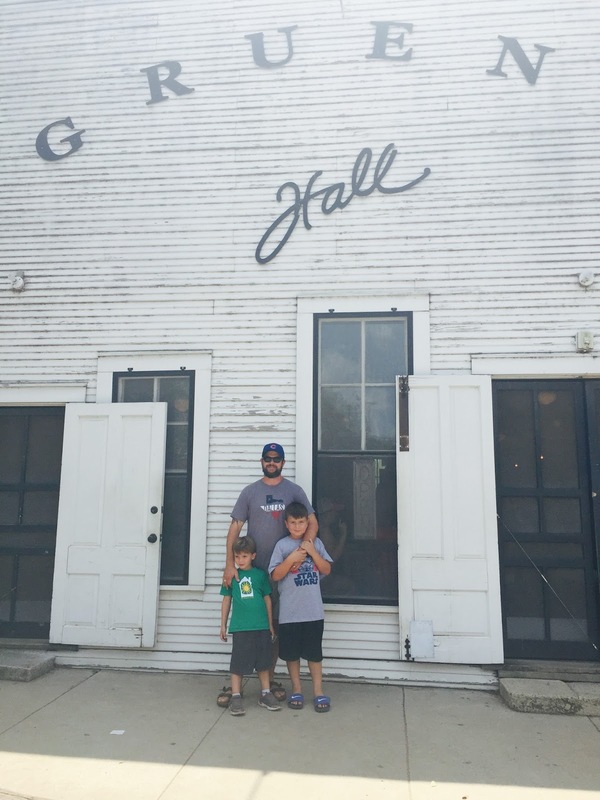 day 4: when we planned our itinerary, we had visions of taking our kids to gruene, eating a relaxing lunch at the grist mill, popping into some shops for a little retail therapy, and ending at gruene hall (the oldest dance hall in texas) where the kids would dance around to the band while the grown-ups downed a cold one. we didn't anticipate that it would be hotter than the surface of the sun outside and that everyone in texas would be in town for the holiday weekend. tiny town + 5 billion people + grumpy bonner kids = ditching gruene after lunch and rushing back to the nearest swimming hole. our last swimming hole was the hardest one to find. it is called cypress falls. it is located behind a hotel lodge, which is where you buy your wristband. apparently there is a little restaurant on the river (which was closed when we arrived) and an area where you can swim. swimming here was the most similar to swimming in an open river. the current was not strong enough to carry you far (as it would if you went tubing on the comal, for example). you can easily float, some kids even had a paddle boat and boards. in one corner of the area is a "hole" surrounded by rocks which people jumped from into the water. it was a nice ending to a super sweaty day. that evening for dinner, we traveled to hays city store (which is really a restaurant) and had easily the best meal of our trip. it's worth it if you are ever in the area. advice for swimming holes: you will need water shoes. you will NOT be dealing with comfortable sandy beaches. bring a soft-sided cooler with water and snacks (or lunch). once you are there, you won't want to leave. and whatever you do, while driving around, for the love of god, listen to some willie nelson. or robert earl keen. or any red dirt/texas/old country music will do. we were all sad to leave, especially the boys (cue crosby's pathetic i-don't-wanna-go-home face). 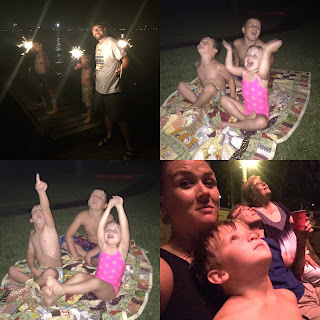 we tried to sweeten the deal with a trip to buccee's and a pit-stop at my parents' lake house for some boating and fireworks. several friends recommended things to see and do that time didn't allow. guess that means we will have to go back. p.s. we drove down river road in wimberley and finally got a visual of the massive devestation caused by the memorial day flood last year that took so many homes and lives of families vacationing just like us. 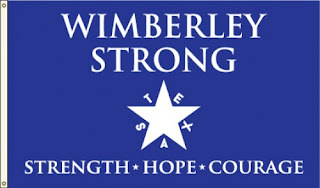 it's been over a year, and no doubt the clean-up has been extensive, but there are still downed trees and foundations without homes as a reminder of such a sad time in wimberley's history.